Bandon dairy farmers James, Pat and Theresa O’Neill, from Clohane, Bandon have been announced winners of the overall prize at the 2018 Carbery Quality Milk Awards held recently in the Fernhill House Hotel, Clonakilty, Co. Cork. This is a family partnership with James farming in partnership with his parents Theresa & Pat. The O’Neill family are milking 210 cows with a 20 unit milking parlour. They were also selected as the regional winners for Bandon Co-op, where they supply their milk for processing in Carbery’s Ballineen facility. Regional winners from the other three shareholder co-ops were Conor and Kevin Moloney, Boxtown, Kilbrittain, from Barryroe Co-op; Brendan and Pauline O’Driscoll, Shreelane, Leap, from Drinagh Co-op, and Colm and Ber O’Sullivan, Kilbree, Clonakilty, from Lisavaird Co-op. 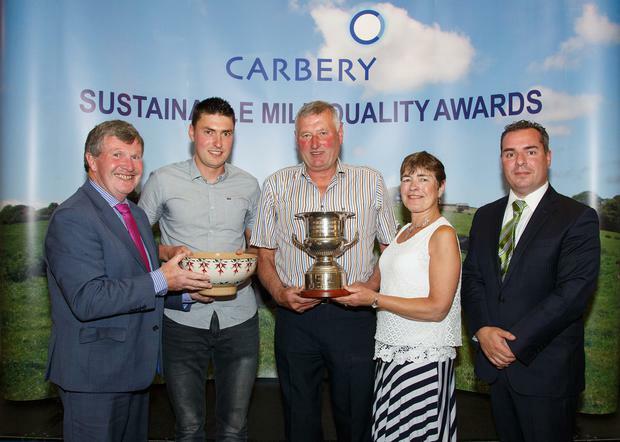 Each finalist was commended for their outstanding attention to detail, with an emphasis on milk quality, sustainability, healthy cows, hygienic facilities and excellent farming practices, all of which are essential to Carbery’s quality of raw material supply which leads to a superior end product. Owned by farming families, Carbery Group processes close to 500 million litres of milk per annum to produce award-winning cheeses and food ingredients in Ballineen. Speaking at the awards Peter Fleming, Chairman of Carbery Group said; “Each year the quality of entries for the Carbery Quality Milk Awards continues to impress. The high standard of products produced by Carbery is thanks to farmers like The O’Neill Family, who put a huge amount of work into their farm, and the quality of milk they are producing is testament to that.